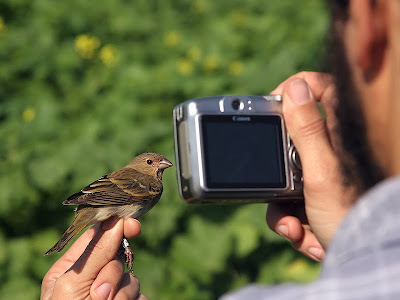 As usual, the phone rings, Yosef is on the other end - rosefinch at Tzor'a! 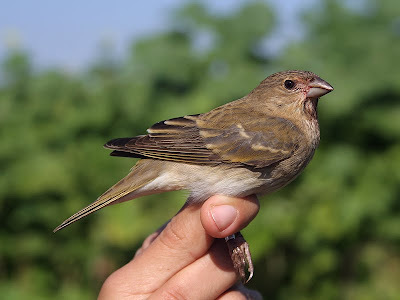 I was waiting for this call as he had a rosefinch in each ringing session he did in the last two weeks. So into the car and off to Tsor'a (10 minutes), bird out of the bag, click-click, and back home. Disgusting. 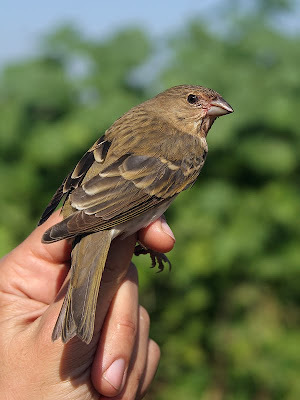 Common Rosefinch is a rare migrant and winter visitor. However this seems to be a good winter for them - three have been ringed in the Hula and three by Yosef at Tsor'a. It's incredible - all three at Tsor'a were caught at exactly the same spot, at exactly the same time (10:30) - in a week's space from each other. This is a 2cy but sexing is impossible at this plumage. The pinkish tones on the face are a result of feeding on blackberries. Yosef - get yourself a proper camera!